WE’VE GOT JARED! What a weekend. 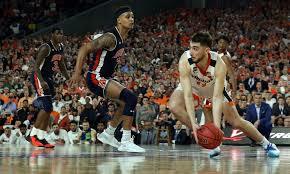 Auburn took down three blue bloods (and the three winningest programs in CBB history) back-to-back-to-back to make its first Final Four. I don’t have any words that can capture the joy and appreciation I have for this team and run. 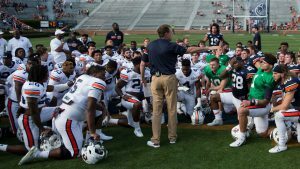 Catch up on or relive a jam-packed Auburn weekend here. You don’t want to actually work today, do you? 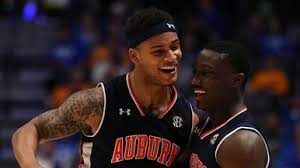 – Auburn followed a dominating performance against Kansas with another dominating performance against North Carolina. Of course, the scene at Toomer’s was electric. – I have to get it out of the way – this song is taking over the Auburn world. The team loves it, the band is playing it. Whatever voodoo magic is involved here should get Son of Crow a ring. 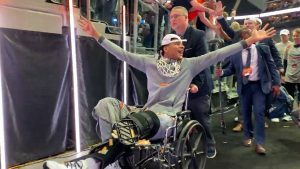 – The team had a difficult time celebrating the UNC win after watching Chuma Okeke go down with an ACL injury. Bruce was visibly upset. With the help of his teammates, Chuma still got to help Auburn advance. – Post-game from the other side: here’s what Roy Williams said after the defeat. 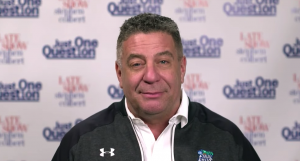 – Some in the media thought Auburn was lost without Chuma, some thought they still had a shot. – See how Kentucky fans disrespected Auburn (shocker) before the Elite 8. Also, did coach Cal somehow out-disrespect the UK fans? – The Kentucky game was much closer than the last two. Auburn’s elite backcourt stood out in the victory, especially in overtime. Somehow, Bryce Brown always finds a way to get it going in the second half. – This is a great breakdown of the game. – Malik Dunbar was the MVP Sunday – see his pregame tribute, in-game toughness, and post-game celebration. – There’s too much post-game content to cover. Here’s the long version of interviews, a shorter look at the on-court celebration, and Charles Barkley’s analysis. – See what coach Cal said after missing the Final Four again. – Here’s Chuma advancing the Auburn sticker again, and a predictably raucous Toomer’s. 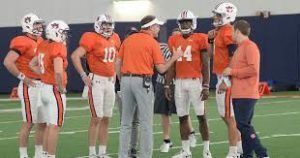 – One extra satisfying effect of Auburn’s historic run is watching both Georgia and Alabama fans argue over whether they should pull for the Tigers. Even a former Alabama QB got involved. – For whatever reason, the run is also bringing Bruce haters out of the woodwork. Here are opinion pieces from Washington Post and USA Today. You’d think Bruce hired prostitutes for recruits or made fake classes for players or something. – Also, a reminder that Tony Barbee is the absolute worst. – Auburn Basketball now has a place in the Twitter bio of Apple’s CEO. – Not only has Auburn beaten the three winningest CBB programs, they’ve beaten them so bad the walk-ons are playing. – Do you think Bryce Brown has a place in the NBA? 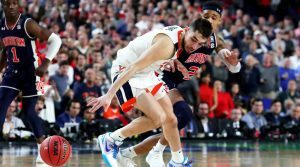 – Here is a good primer for the Final Four matchups, including a good breakdown for my gambling friends. – Lost in all of this was Football’s first Spring scrimmage. Here was Gus’ take. Here’s an update on the QB battle. 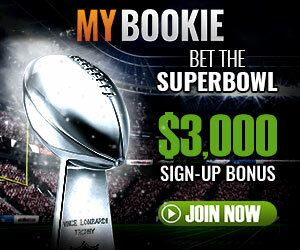 – Which position group is outperforming expectations so far? – See how Baseball fared against South Carolina this weekend. Hint – not a good weekend for the Carolinas. Here are highlights of the opener and the rubber match. – Finally, Equestrian is still undefeated and are now SEC champs. Is this the greatest Equestrian team ever? Here are highlights of their first contest against South Carolina (did I mention it was a bad weekend for the Carolinas?) and their SEC Title win over Texas A&M.